Rich Dad’s The Business School is a book written by Robert T. Kiyosaki and his co-author Sharon L. Lechter on network marketing business and in the latest edition the concepts are further updated and elaborated. 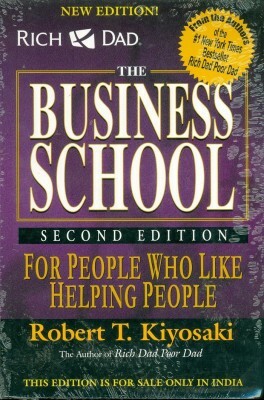 Summary Of The Book In the first edition of Rich Dad’s The Business School, the author had dealt with the principles of network marketing and the eight hidden values, and in the second edition, he has further expanded the same with more updated principles and values of network marketing. According to Robert T. Kiyosaki, the building of a network marketing business is a revolutionary idea to make money. He says that through network marketing, it is possible for anyone to amass wealth. All that is required is that one needs to have the initiative and drive and must have the determination to achieve the goal. It is open to anyone who has the above qualities. He adds that one must not give up. The book describes what the real values of network marketing business are. It is more than just making money. He says that it is a business having a heart. Rich Dad’s The Business School does not promote any specific network marketing organisation, but aims to educate the reader on how to select one. He took care to educate and guide the reader in the proper approach for selecting network marketing business. Three of his books of the Rich Dad, Poor Dad series were at number one on the top 10 best seller books as rated by The Wall Street Journal, USA To-day, and The New York Times. About The Authors Robert T. Kiyosaki has been recognized as one of the best among the authors who have written on Network Marketing Business. He is also an investor, businessman, and motivational speaker. Robert has also authored other bestsellers such as the Rich Dad Poor Dad Series, which included Rich Dad, Poor Dad, Rich Dad’s CASHFLOW Quadrant: Rich Dad’s Guide to Financial Freedom, and Rich Dad’s Guide to Investing: What the Rich Invest in, That the Poor and the Middle Class Do Not!. The author adopted a revolutionary approach in his books. His focus was on highlighting the intangible benefits of choosing network marketing business. He advocated that financial concepts should be taught in schools. Robert T. Kiyosaki is a Japanese American born and brought up in Hawaii. He served in the U.S. Navy and fought in the Vietnam war, and later left the Navy and worked as a salesman. He retired when he was 47 and later took up authoring books. He is the co-founder of CASHFLOW Technologies Inc. He is married to Kim, who is a business woman, speaker, and investor. Sharon L. Lechter is an American author, accountant, philanthropist, and investor. Think and Grow Rich: Three Feet from Gold, Escape the Rat, and Why We Want You to be Rich are some of the books authored by Lechter. She has also co-authored books from the Rich Dad Series along with Robert Kiyosaki. The author is one of the founders of The Rich Dad Companies. Besides, Lechter is a co-inventer of the Cashflow for kids board game. She has a degree in accountancy from the Florida State University. She has three children. Her husband Michael A. Lechter is the President and CEO of Tech Press.